President Bill Clinton received an honorary degree from UCF President John C. Hitt for his service as president and also his service as a humanitarian and international ambassador since he left office. President Bill Clinton made UCF history today as the second United States president to speak at a commencement ceremony. On Thursday afternoon, President Clinton addressed graduates from the College of Health and Public Affairs and the College of Medicine’s Burnett School of Biomedical Sciences. President Clinton has spoken publicly in the past about the successes of Central Florida and UCF, and he discussed the region’s high level of cooperation between the public and private sectors during his speech, which marked his third visit to UCF. “The successes of UCF are all a testimony to the fact that no matter how smart we are, how righteous we are, how close to the truth we are, we all do better when we work together,” President Clinton said. His address emphasized the importance of helping others, accepting each other’s differences and working together. He also highlighted I.D.E.A.S., an organization founded by two UCF students to inspire and promote sustainability by providing other students and community members with opportunities to get involved in environmental and service-learning projects. 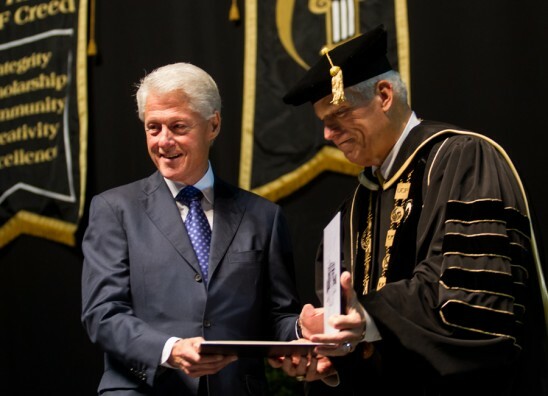 President Clinton also was awarded an honorary Doctor of Humane Letters degree by President John C. Hitt. The degree recognizes his service as the 42nd President of the United States, as well as his work with the William J. Clinton Foundation both nationally and internationally. More than 3,100 students graduated during Thursday’s two ceremonies. Nearly 4,700 other students are expected to graduate during ceremonies on Friday and Saturday. Among Thursday’s graduates is Leslie Salas, who received a master of fine arts degree in creative writing. More information about commencement can be found at http://registrar.sdes.ucf.edu/commencement/terms/2013/spring/.